Tri-State laundry Equipment Co. makes self-service laundry easy with only the best equipment available and that’s the industry front load pioneer Wascomat. For durability, quality and value Wascomat is the industry's undisputed leader in self-service laundry equipment. Tri-State's NC coin laundry equipment solution is a complete package of experience for self-service laundry starting with replacement equipment, getting rid of old utility hogs and adding profit to your bottom line. 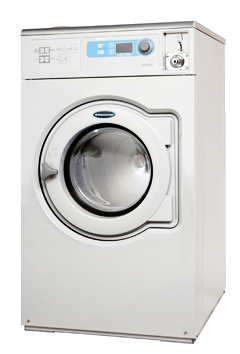 For new facilities Tri-State understands what makes self-service laundry work best. Our site selection, location demographics, and competition analyses to facility design, engineering and installation are the details for success and where Tri-State excels. With Tri-State’s industry knowledge and Wascomat’s laundry equipment quality and durability your laundry project is completed with success. Look through our top quality manufactures of self-service laundry products such as ESD electronic payment systems, Wascomat laundry equipment, ADC dryer and Whirlpool Commercial Laundry and call Tri-State Laundry's SC coin laundry equipment experts for your project made easy.